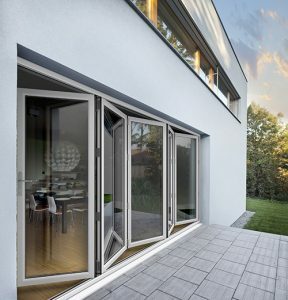 Integral bi-folds come with many innovative features comprising of specifically engineered robust double-walled aluminium profiles, double hinge fixings, stainless-steel tracks and brushed rollers providing Integral with the additional rigidity to stand up to years of repeated use. They can accommodate up to seven leaves with a width of 700 to 1000 mm. Carmen Velilla, Brand Manager at Epwin Window Systems said: “Mercury is a longstanding and loyal Vertical Slider customer to Spectus, an Epwin Window Systems brand, and we are delighted they have taken on our new Integral bi-folding door too. With the design technology behind Integral and Mercury’s fabrication knowledge, we feel sure it will be prove to be a winning combination for them.” Mercury manufactures the new Integral bi-folds from its Gloucester specialist fabrication plant. All Integral bi-folds from Mercury come with PAS24:2016 as standard and are available in a choice of colours.